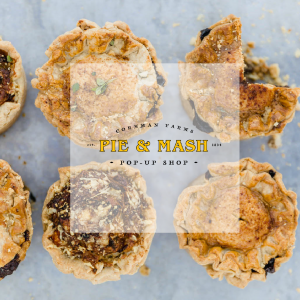 Inspired by British owner Kieron Hales’ homeland, we’re transforming our farmhouse into a traditional English Pie & Mash shop! This hearty, age-old comfort food features a savory handmade pie with mashed potatoes, seasonal veggies and Chef Kieron’s creamy and indulgent Devon Fudge, a recipe from his hometown…all for $19! Check out this week’s menu below. We will be making a limited number of pies each week, so pre-ordering is encouraged to guarantee your pie. All pre-orders will be fulfilled and walk-ins will be honored on a first-come first serve-basis. Guest are welcome to takeout or dine-in at one of our farmhouse tables! In addition to delicious pie and mash we will also be selling beer and wine to enjoy while dining in or at home. Bacon Homity Pie: A delicious open faced pastry crust filled with rich and buttery russet potatoes, leeks, smoked bacon and garlic topped with plenty of cheddar cheese. Parsley Liquor Sauce: This is a traditional British sauce that is served with every pie. It is simple yet delicious made with chicken stock, parsley and garlic. Mashed Potatoes: A simple and delicious recipe: potatoes, lots of butter and salt and pepper. Carrot & Swede Puree: Our field carrots and rutabagas are cooked down with butter, thyme and local honey for the perfect sweet, savory and creamy side dish. A new farm favorite! Sea Salt Caramel Fudge: Creamy and indulgent, this mouthwatering fudge recipe is from Kieron’s home town.